“Shrouded in darkness, a piano soloist brings a 40-piece orchestra to life by triggering lights and musical patterns.” This appropriately tantalising description in the festival program draws a hungry audience to BIFEM’s blockbuster finale. Concluding a weekend of exemplary community engagement, local gem the Bendigo Symphony Orchestra rises to the challenge of delivering the Australian premiere of pho:ton, a multi-sensory work composed and designed by COD.ACT, the Swiss brothers André and Michel Décosterd. With pianist Peter Dumsday, the orchestra enraptures its audience. A chatty audience is abruptly silenced when the lights fade, leaving hundreds of eyes darting across a pitch-black stage, searching for something to focus on. Out of the darkness emerges a steady snare drum line, interjected by sparse yet measured, long tones from a bass trombone. 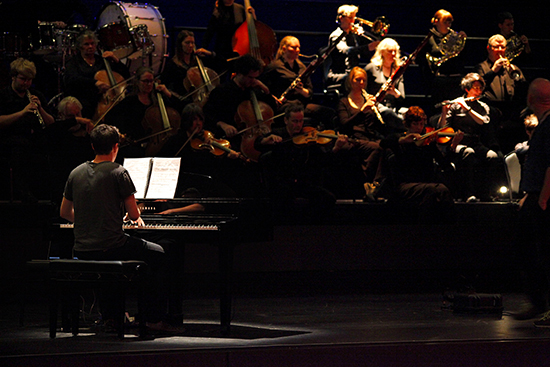 As each note is played, a spotlight illuminates the player. I assume Dumsday will be a soloist. Instead, his instrument has forfeited its natural resonance and morphed into an electronic device, where each key is a button that activates a designated light above each performer. 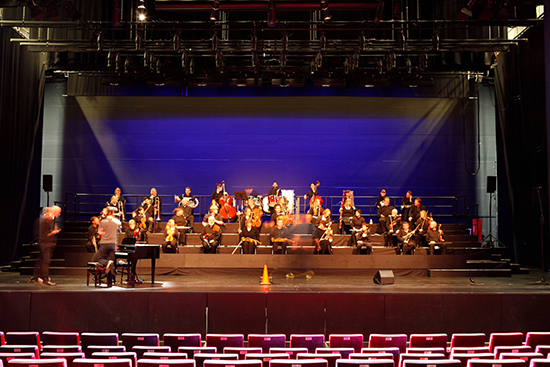 Solo players in the upper strings join in a gradually building pattern, spectators eagerly following the lights as they flicker across the orchestra. Something of a melody forms as disjunct tones increase in pace, resulting in the odd overlap of lighting patterns. As more and more players are illuminated, we begin to fully appreciate the practical nature of the orchestra’s unusual distribution on the stage. By placing the musicians in elevated rows and columns in a rectilinear grid, the brothers Décosterd are able to maintain the spontaneous nature of each illumination. A brief flash of red illuminates the stage allowing us to see the entire ensemble for the first time. Engulfed in darkness once again, we soon realise that red was the warning signal for an upcoming passage of sheer visual insanity. In sync with downbeats of the music, vertical lines of light move across the orchestra, illuminating different groups of players as they go. Next, horizontal lines move up and down, until these two patterns criss-cross to create a strobing effect, which builds in intensity and culminates in an erratic pattern of diagonally travelling lights. Musically speaking, pho:ton is quite a simple piece. Yet there are inherent difficulties when every player has solo passages, since section players are prevented from relying on their principals (often a helpful practice in non-professional orchestras). Indeed, some rhythmic patterns placed rank and file players outside their comfort zone. Nonetheless Peter Dumsday and the Bendigo Symphony Orchestra performed admirably and the many thrilling visuals added a whole new dimension to an already colourful symphonic sound. In piecing together this truly egalitarian work, the orchestra demonstrated just how much regional communities are capable of achieving when given equal opportunity to embrace serious artistic challenges.